The hot air balloons are freed and the whole house rises up! It was very nice to see the floating house crossing the city. During the journey it approaches a power line that is used as an observation post by a flock of pigeons. When house passes by, the flock flies alongside it and we can see, for just a moment, how they fly very close to the protagonist, Mr. Fredricksen. However, the pigeons are only distant animals or blurred figures. That’s all. Later, we can see other birds, but not pigeons. 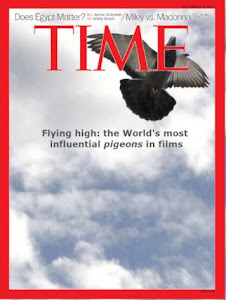 I understand that this is not a film about pigeons but it is a shame that with a $175M dollar budget they didn’t address devote resources to pigeon appearances. 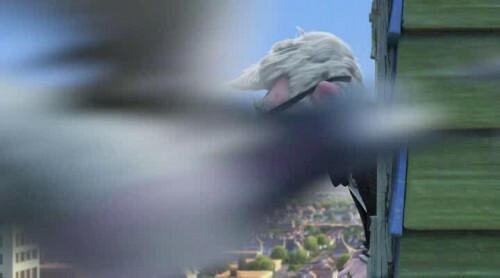 For instance, it would be funny to see a curious pigeon approaching the house and interacting with Mr. Fredricksen. Probably he would scare it away. We can see a blurred pigeon on the foreground. Pigeon activity: It is a typical urban flock of pigeons resting on a power line. It is not clear if they are scared by the floating house or they approach it with curiosity. 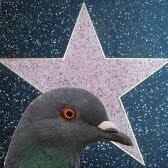 Symbolism: They are common urban pigeons. Relevance: Nothing. They appear briefly in the film. I find this animation film very inspiring with a bit of sadness to it however the happy ending is indeed heart warming and makes you want to treasure the people that are close to you.